A few weeks ago Merlin arrived at DBARC having left behind him a life of neglect and cruelty. He had multiple physical and emotional injuries that had been inflicted during years in the breeding industry. The most obvious concern as a huge leg tumour but in addition his first dental revealed a mouth full of terribly worn down teeth, many of which needed removing. The pattern of damage to his teeth was highly suggestive of him repeatedly chewing on something hard and resistant, most likely bars in an attempt to get out of where he’d been kept for years. His claws were severely damaged, again probably as a result of scrabbling to get out of where he was. Imagine the poor boy shredding his frail but desperate body, hurting himself in vain, trying to free himself from his torment. His ears were badly infected, but responded to treatment, relieving his obvious discomfort. He has severe dry eye, painful and left untreated for years which has badly affected his eyes. His skin was in a dreadful state with many sores. A lengthy treatment regime for parasites and skin care is well underway, and will be ongoing for quite a while. But, despite all this awfulness, Merlin’s a brave, compliant patient; he’s steadily trusting Julie, his main carer at DBARC and gently coming forwards to her now rather than fearing human contact. Now we must tell you that the massive leg tumour turned out to be a sarcoma and the only way to save his life, was to remove his leg. The amputation has gone well and Merlin will recover and live a happy, pain free life as a tri-paw. DBARC will ensure he finds the perfect home and will take care of all his ongoing needs, thanks to the fundraising done by us with Schnauzerfest. UPDATE: Following his surgery, Merlin was adopted by his wonderful mums Jan and Jackie and joined their family of 3 schnauzers. He won the DBARC Dog of Courage Award at the summer fun day in July 2017. Merlin with mum Jan, winning the Dog of Courage Award, DBARC. Merlin adapted well to his tripaw life. Unfortunately in August 2018 he ruptured his cruciate ligament in his remaining back leg. This required major surgery and his recovery was hard for him. But, he is a brave dog, and he continues to recuperate, with ongoing support and love from his whole DBARC family. 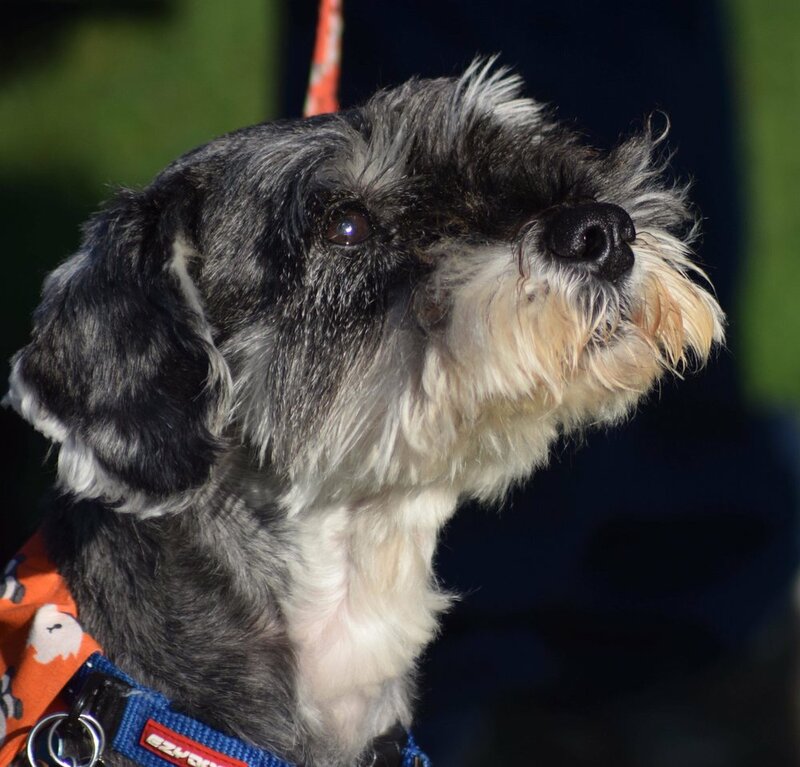 Donating to Schnauzerfest means that whatever the future holds for Merlin, he will get everything he needs and always be safe.